Ann Veneman was the Executive Director of UNICEF from 2005 to 2010. Her appointment was announced on January 18, 2005 by UN Secretary-General Kofi Annan. 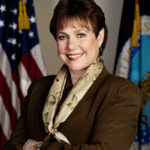 Previously, Veneman was the United States Secretary of Agriculture, the first, and as of 2017 the only, woman to hold that position. Veneman served as USDA Secretary from January 20, 2001 to January 20, 2005, leaving to become the fifth executive director of UNICEF. She served in this position from May 1, 2005. A lawyer, Veneman has practiced law in Washington, DC and California, including being a deputy public defender. "We are doing everything we can to protect the food supply. And I can tell you that we’re making decisions based upon sound science and good public policy, given the circumstances that we are now in." "I think it’s important that, as a matter of course, the brain and spinal column were removed from this cow, and that would be the material that would cause concern in terms of human health. And therefore we’re confident in the safety of the food supply." "I also believe that it’s the right thing to do, to maintain strong consumer confidence in our food systems. And I believe that the consumer should have strong confidence in our food systems." "We’ve had risk assessments performed by Harvard University, which said that even if we did have a small number of cases in this country that the likelihood of it spreading or getting into any kind of human health problem is very, very small." "But the fact of the matter is that all scientific evidence would show, based upon what we know about this disease, that muscle cuts – that is, the meat of the animal itself – should not cause any risk to human health." "I have to say that in this particular cow that we’re dealing with, those parts of the cow were removed, and so we don’t think there’s any risk or very negligible risk to human health with this particular incident." "The demand for beef in Canada remains strong because I think people in America, in North America, know that we have a very strong food safety system and that our food is safe to eat." "I’m confident that we have measures in place. And the additional measures that we announced yesterday will be even more protective of our food supply in this country." "Great Britain had a much different situation than we do and did here in the United States, in that they had literally thousands of infected animals with human health risks. Their infectivity in this disease happened before very much was known about it."